I am often asked at workshops, "Do you scrapbook too?" I never want to discourage anyone from working with their hands to make things so I politely say, "No, I just don't have the time." However, my feelings are not so kind. For me, making books is about creativity not consumerism and scrapbooking is the reverse. Because so much of the material is purchased, there is a look of sameness and artificiality about the pages even when they are well designed. 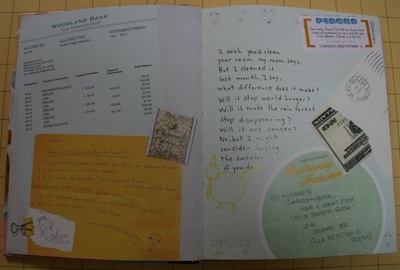 My main push to begin making books from recycled materials came from environmental awareness, but the commercial quality of scrapbooking also gave me a nudge. I wanted to make the point that you don't need to buy things to make things. If I don't love scrapbooking as it is done today, I do love scrapbooks. 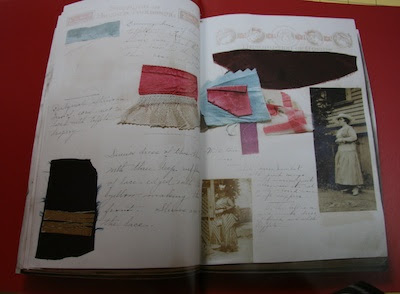 Jessica Helfand's Scrapbooks: An American History is a beautifully designed and written study. Over the past eighteen months, in preparation for this book, I have traveled the country looking for examples that met five essentials criteria. First, because I am a visual historian, they needed to be beautiful: this was and has remained my primary point of entry. 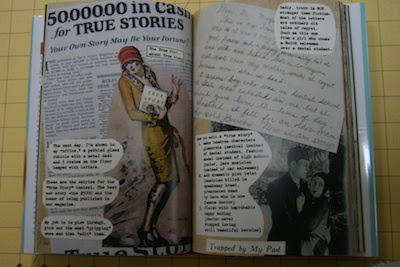 Second, once I was drawn into a beautiful scrapbook, there needed to be a payoff, a there there—a story worth telling. Third, the scrapbook selected for inclusion in this book needed to be eclectic: scrapbooks consisting solely of photographs or merely of clippings were rejected, as they lacked the formal complexity that I believed would most convincingly represent the person and the moment in which that individual lived. Fourth, I was convinced from the start that this book needed to include both celebrities and civilians...Finally, I restricted my research to American scrapbooks. 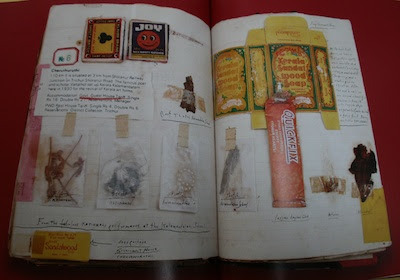 The scrapbook was the original open-source technology, a unique form of self-expression that celebrated visual sampling, culture mixing, and the appropriation and redistribution of existing media. Over time, it came to mirror the changing pulse of American cultural life—a life of episodic moments, randomly reflected in a news clipping or silhouetted photograph, a lock of baby hair or a Western Union telegram. As a genre unto themselves, scrapbooks represent a fascinating, yet virtually unexplored visual vernacular, a world of makeshift means and primitive methods, of gestural madness and unruly visions, of piety and poetry and a million private plagiarisms. As author, editor, photographer, curator, and inevitable protagonist, the scrapbook maker engaged in what seems today, in retrospect, a comparatively crude exercise in graphic design. Combining pictures, words, and a wealth of personal ephemera, the resulting works represent amateur yet stunningly authoritative examples of a particular strain of visual autobiography, a genre rich in emotional, pictorial, and sensory detail. Author and archivist Caroline Preston has created a thoroughly enchanting book—a novel in pictures—called The Scrapbook of Frankie Pratt. 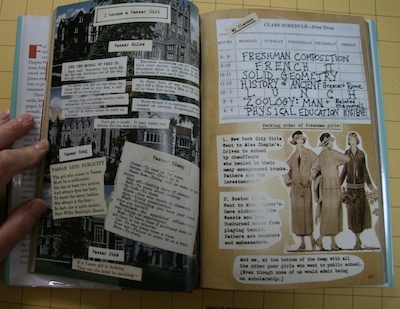 Told completely in scrapbook form, Frankie's story begins in Cornish, NH in 1920 when she graduates from high school and then goes on to Vassar, New York City, and Paris. I was very impressed with how rich and emotional the story is in this format. I wanted to also share a children's/young adult book in a similar style. Members of the New England Society of Children's Book Writers and Illustrators listserve kindly shared suggestions. There were some wonderful books, but the only one that truly fit the bill—a story told completely though a scrapbook was Middle School is Worse Than Meatloaf: A Year Told Through Stuff by Jennifer L. Holm. Ginny's worst school year ever—seventh grade—told through lists, bank statements, notes, school essays, and various objects—is a warm, funny, and engaging story. Thank you for voicing a sentiment I share: you don't have to buy things to make things. While I, too, will never discourage a person's desire to create, a visit to a craft store always leaves me befuddled at the amount of equipment and supplies we are told we need in order to do anything. My own repurposed materials and scrounged supplies began from financial necessity, but I quickly found it was more interesting to me anyway. I don't think my work looks "scrounged" but it also doesn't look like it came from the store. i can appreciate the sentiments i do not share! While the commercialness of my scrapbooks are not my favorite feature of them, it helps with my goal to get the photos into the books. Photos in books, in a context, are easier to understand and appreciate. There is so much about my inherited photos that i wish i understood. And i do not wish to allow to my kids' current interests to determine what i transmit to them. So many people say they wish they'd talked more with a grandparent, or wish a living parent remembered more NOW about earlier life. As far as the endless supplies in the stores, i find them kid in the candy store exciting, but they are hardly necessary. We should never believe that. Though some of the products do help with longevity of the finished product, which is one of my goals, and we always need to keep our goal in mind. Thanks for letting me share! And thank YOU for sharing!